"good morning just wonted to say thanks agin for breakfast this morning. and to tall you that my mom says thanx to. i wonted to say have a good weekend and a Marry Christmas and thanx for leting me talk to you when i needed to and for being so suppurtiv and for being a nice teacher to not just me to every 1 so Marry Christmas and t alk to you latter." so, even though i'm TIRED and so ready for this break, this is what reminds me that i love my job! in other news: i have been so looking forward to this break, partly to get a jump start on getting back in shape, starting to run again, hopefully getting back into the habit, etc. well, on day 1 of my break i'm playing indoor soccer and i step on the ball, turn my ankle and can't even WALK! to make matters worse, we didn't have any subs for the game, so i kept playing, on one foot. i was such a worthless team member! 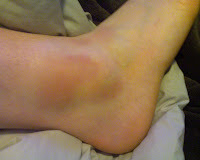 so, here's a pic of the ankle. the picture really doesn't do it justice. it's very purple and swollen. i think god has a sick sense of humor, thwarting my ambitious plans of getting back into shape over break. but really, who tries to get in shape BEFORE new years??? remember in college, when we would stay up all night to "study" for finals... really we were just watching movies, eating junk food, and cracking the occasional text book. how i miss those days. i just submitted my final project for one of my graduate classes and it was 25 pages long. ick. i'm tired of sitting and typing. and i think i have a callous on my right index finger from using the touchpad on my laptop. it feels good to be done. now i can party. yeah, who am i kidding?? i'll probably fall asleep on the couch by 8:00 tonight! ha! 5 work days until christmas break! woop woop! i know i've been a crappy blogger, but i don't think i've ever been this busy in my life! i think i've lost some of my multi-tasking capabilities because i used to be able to handle a lot of different things all at once and now i'm just WEARY. but anyway, today warranted a blog post because it was a good day. my students read today for 10 whole minutes, completely SILENT. they only complained for a minute and then i set the oven timer and told them that i would let the timer run while they read. but if they talked or stopped reading i would stop the timer and they would just cut into their free time the longer it took to get back to reading. it totally worked. this may not seem like an accomplishment but i assure you, it is. secondly, i have gotten 3 new students in the past 2 weeks. two of the three came from alternate "facilities" and let's just say that the transition back into a "normal" school should not be expected to go completely smoothly. one of the kids has been in and out of several different schools, foster homes, jail, running away from foster homes, and hasn't been in school for almost a year. he is really far behind as far as credits go and that's discouraging to go into classes with students that are several years younger than him and still not understand what's going on because he's been out of the school "habits" for a year. day one this kid tells me he's probably just going to drop out and if he wasn't in school he'd just be on the streets doing "illegal stuff." i didn't even see this kid for the first few days that he was supposed to be at school because instead of going to classes he decided to wander the halls all day to avoid class. i finally caught up with him one day and he ended up sitting with me and venting for an hour about how frustrating it is to try to get ahead with so much stacked up against him. the next day, he came to my class. ok, fast forward 2 weeks to today. he went to ALL of his classes today! by the end of the day he got frustrated in his last class and walked out but instead of walking the halls he came to me. i called his teacher to let her know he was with me and he ended up working with me on his science classwork. we learned the difference between power and work and how to find them using equations. we looked up Usain Bolt online and talked about how if Ms. Hutson raced Usain Bolt in the 100 meter dash that we would do the same amount of work (force x distance) even if i took WAY more time to finish. but since the equation for power factors in time (P = work/time), who would be more powerful? "Quit playin, Ms. Hutson. Bolt mo' powerful." i need you guys to understand how much i hate science, but i taught this kid some science today. i don't think Usain Bolt taught anyone science today. anyway, i've gotten to where i can joke with this kid but also lay down the law when i need to. i gave him a stern look and gave him a little "mom" lecture about his girlfriend and school and whether he should drop out and get his GED...etc. then i stopped and said, "you know what? i'm not going to tell you what to do. if you want to talk to me, you're more than welcome, but i don't want you to feel like i'm in your business." he said, "Ms. Hutson, i like talkin' to you. people always trying to get me to talk to counselors, but i say, 'man, i need to talk to Ms. Hutson! don't need no counselors!'" later i heard him telling another student, "Ms. Hutson my savior, man. it weren't for her, i wouldn't be doing NOTHIN." that was huge. it was a good day.